This year marks the 30th anniversary of Toyota’s first appearance at the 24 Hours of Le Mans. Back in 1985 its hopes were pinned on the 85C-L, the two-car effort managing a respectable 12th place for the #36 car, while the #38 entry did not finish. Today, Toyota will fight for the ultimate Le Mans success with the TS040. Again the team will have two cars, carrying the numbers #1 and #2. And with four second place finishes at the Circuit de la Sarthe (1992, 1994, 1999 and 2013) you could say Toyota is due for a win on Sunday afternoon. 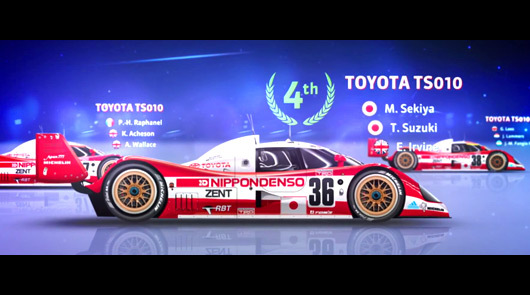 You can relive Toyota’s Le Mans history with a very slick short film after the break. This weekend Toyota once again bids to claim one of the greatest prizes in world motorsport: victory in the Le Mans 24 Hours. To mark the 30th anniversary of Toyota’s first official participation in the race, a new short film has been released, charting the story of its racing campaigns. From its earliest involvement as a manufacturer, supplying engines for the Dome and TOM’s teams in the 1980s, through to today’s technically advanced TS040 Hybrid, Toyota has long been a committed and respected competitor. In 16 races entered, it has secured a series of impressive results, but has yet to mount the top step of the podium. As the current World Champions in the World Endurance Championship, Toyota Gazoo Racing has the pedigree and the potential to prosper in this year’s race, with two TS040 Hybrid cars set to take to the track. The three-man driver squads for each car include leading British talent: Anthony Davidson, the current joint World Champion (with team-mate Sebastien Buemi) is in the line-up for the No1 car, with fellow Briton Mike Conway embarking on his first Le Mans as a Toyota pilot in the No2 car. The new short film is available to view now on the Toyota GB blog. Qualifying for this year’s Le Mans takes place this Wednesday and Thursday with the race getting under way at 3pm local time this Saturday. 1985 No36 (85C-L): qualifying 29th; Race 12th. No 38 (85C-L): qualifying 22nd; race DNF (mechanical). 1986 No36 (86C-L): qualifying 40th; race DNF (mechanical). No38 (86C-L): qualifying 30th; race 20th. 1987 No36 (87C-L): qualifying 14th; race DNF (mechanical). No37 (87C-L): qualifying 16th; race DNF (mechanical). 1988 No36 (88C): qualifying 8th; race 12th. No37 (88C): qualifying 10th; race 24th. 1989 No36 (89C-V): qualifying 24th; race DNF (mechanical). No37 (89C-V): qualifying 17th; race DNF (accident). No38 (88C): qualifying 25th; race DNF (accident). 1990 No36 (90C-V): qualifying 10th; race 6th. No37 (90C-V): qualifying 14th; race DNF (accident). No38 (90C-V): qualifying 16th; race DNF (mechanical). 1992 No7 (TS010): qualifying 3rd; race DNF (mechanical). No8 (TS010): qualifying 4th; race 8th. No33 (TS010): qualifying 5th; race 2nd. No34 (92C-V): qualifying 11th; race 9th. No35 (92C-V): qualifying 15th; race 5th. 1993 No22 (93C-V): qualifying 10th; race 5th. No25 (93C-V): qualifying 12th; race 6th. No36 (TS010): qualifying 2nd; race 4th. No37 (TS010): qualifying 5th; race DNF (mechanical). No38 (TS010): qualifying 4th; race 8th. 1994 No 1 (94 C-V): qualifying 4th; race 2nd. No4 (94 C-V): qualifying 8th; race 4th. 1995 No27 (Supra LM): qualifying 30th; race 14th. 1996 No57 (Supra LM): qualifying 36th; race DNF (accident). 1998 No27 (TS020): qualifying 8th; race 9th. No28 (TS020): qualifying 2nd; race DNF (accident). No29 (TS020): qualifying 7th; race DNF (mechanical). 1999 No1 (TS020): qualifying 1st; race DNF (accident). No2 (TS020): qualifying 2nd; race DNF (accident). No3 (TS020): qualifying 8th; race 2nd. 2012 No7 (TS030 HYBRID): qualifying 5th; race DNF (mechanical). No8 (TS030 HYBRID): qualifying: 3rd; race DNF (accident). 2013 No7 (TS030 HYBRID): qualifying 5th; race 4th. No8 (TS030 HYBRID): qualifying 4th; race 2nd. 2014 No7 (TS040 HYBRID): qualifying 1st; race DNF (mechanical). No8 (TS040 HYBRID): qualifying 3rd; race 3rd.